NBC News reporter Ben Popken announced Friday on Twitter that he reported someone for "abusive behavior" because they tweeted "learn to code" at him and Twitter responded by suspending the account "within 20 minutes." "'Learn to code' was tweeted at me by a sketchy account," Popken tweeted. "I reported it as abusive behavior as part of targeted harassment. Twitter suspended the account within 20 minutes." "Journalists if they tweet 'learn to code' at you don't stay silent, take a moment to report it," he said. "Twitter will review it and if they determine it violates their rules against abusive behavior they will take action," he said in a follow-up tweet. Twitter will review it and if they determine it violates their rules against abusive behavior they will take action. Incidentally, his post got "ratioed" to hell by what journos will no doubt soon be calling "comment mobs." Hang in there bud. There are Soldiers in Afghanistan looking for you to set an example of bravery for them to emulate. Imagine being this sensitive but also wanting to be taken seriously. It goes on like that for another 4,700+ comments. I guess he's going to have a lot of reporting to do! Lavin is best known for leading what many would describe as a "brigade attack" against ICE agent Justin Gaertner, a combat-wounded US marine, who Lavin falsely accused of having a "Nazi tattoo" of an "Iron Cross" on his arm. 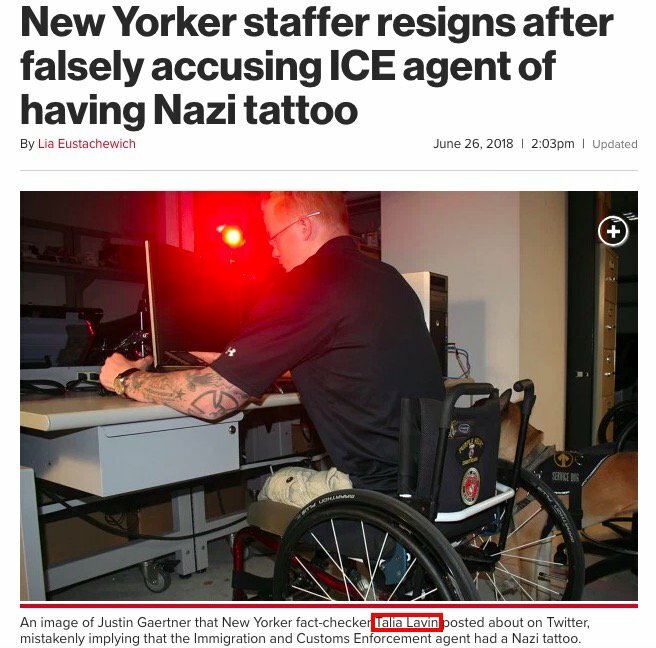 Lavin "resigned" from the New Yorker shortly after it was revealed the tattoo was actually "the 'Titan 2,'" which was "the symbol for his platoon while he fought in Afghanistan." This is the "heroism of the journo" the Washington Post's Super Bowl ad captured so well.